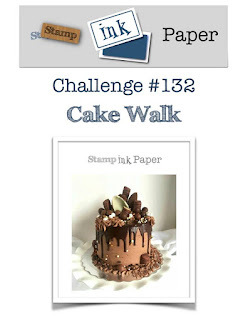 So since this is of course Tuesday, it's time for another Stamp, Ink, Paper Challenge and this one is a Cake Walk! Really, it is! I am in love with the Sweet Soiree Suite from Stampin' Up! Everything about it is so pretty and there are so many elements and layers to it all. The last card I made with it was a little wild so I decided to go with something a little more subtle for the cake this time. What do you think? I stamped my cake with Versamark Ink onto 110# Neenah Classic Crest Solar White Cardstock and then heat embossed it in silver. The background cardstock is Stampin' Up! Soft Sky and was dry embossed with the Pinewood Planks Dynamic Embossing Folder. Since I had left everything else pretty monochromatic with the gray, silver, and white I felt that the background needed some color and texture. The celebrate die cut is from the Celebrate You Thinlits dies that are free with a $100 purchase during Sale-a-bration with Stampin' Up! I love to have thinlits to add a sentiment to an area that otherwise would have been hard to have one added. The textured background was ther perfect example of that. I used the "celebrate" die to cut the word out of Basic Gray Cardstock. The "you" was from the Amazing You Stamp Set which is also a SAB freebie for a $50 purchase. I decided added the "you" embossed in Soft Sky onto a small white rectangle would work perfectly within one of the small sections of planks. When I finished my panel, I backed it in scallop matt of Basic Gray cardstock cut with one of my favorite Mama Elephant dies. I mounted all of that on a 110# Neenah Classic Crest Solar White Top Folding card base. To finish this one off I added some Lucy's Little Things Sea Spray Sequin mix. I knew I needed to add a bit more blue and that sequin mix was perfect for a blue, clear and irridescent mixture. I ended up added a small Whisper White and Silver Twine bow in the upper left hand corner.